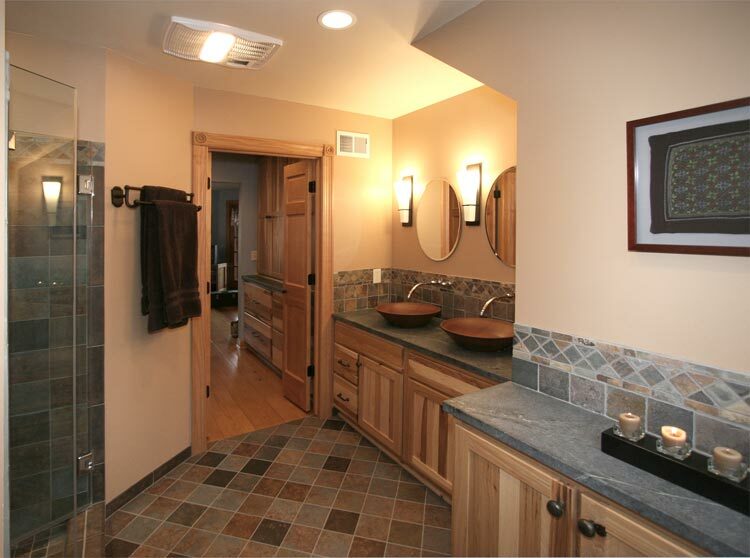 Using natural stone products, native color cabinetry and accessories, bond this Master Bathrooms truly Natural Southwestern theme. 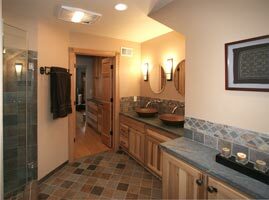 A innovative mix of color and textures are becoming the norm for one of the most popular themes for the Lake Country of Wisconsin. 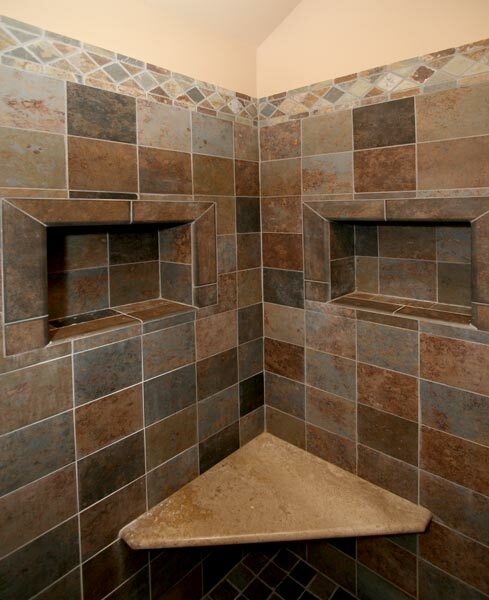 The homeowner’s were looking for a more spacious bathroom with a larger shower and one that would accommodate additional storage space (cabinetry), all this while maintaining a southwest theme. 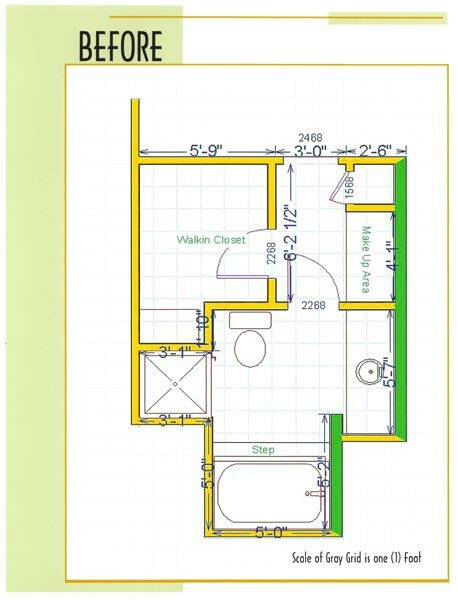 Also, complete this without moving load bearing walls or disturbing the ceiling below. Their tub had not been used for quite some time, for safety reasons. 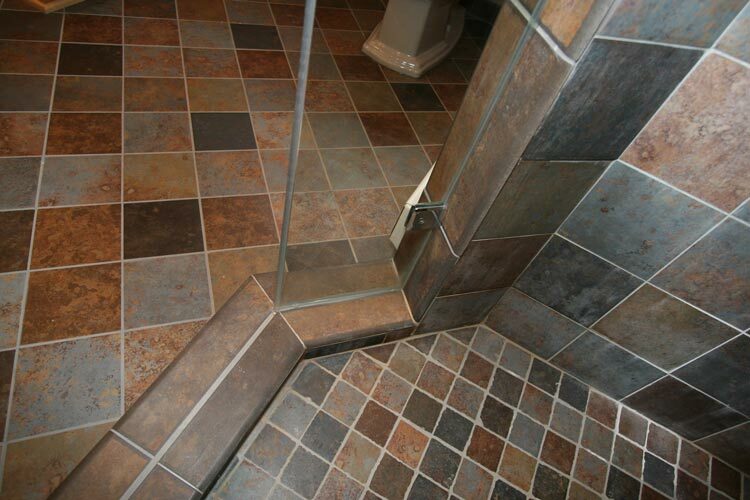 Having a shiny, slippery tile surface made it an extreme hazard when bathing their two small children. 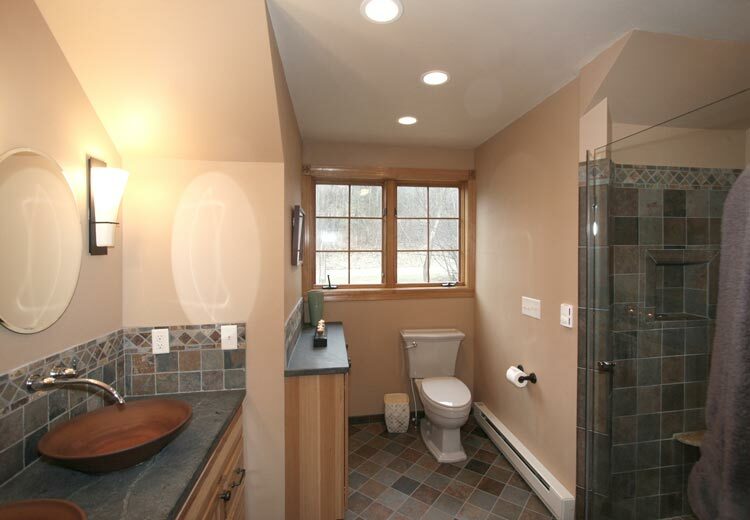 Also, the only window in this bathroom happened to be on the back wall of the tub. 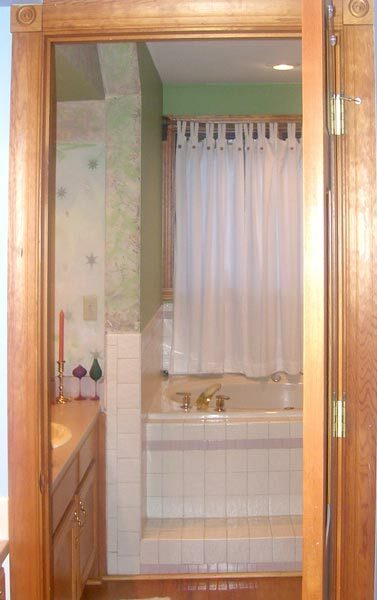 If they wanted to open or close it, they would actually have to step up into the tub. 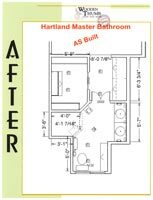 the budget didn’t allow for expansion, so the new bathroom design couldn’t physically be bigger but, had to feel bigger. 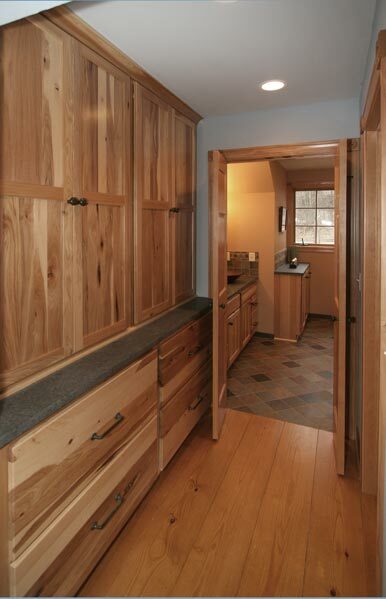 A real challenge was in creating the feeling of a bigger space, but without adding more space structurally. 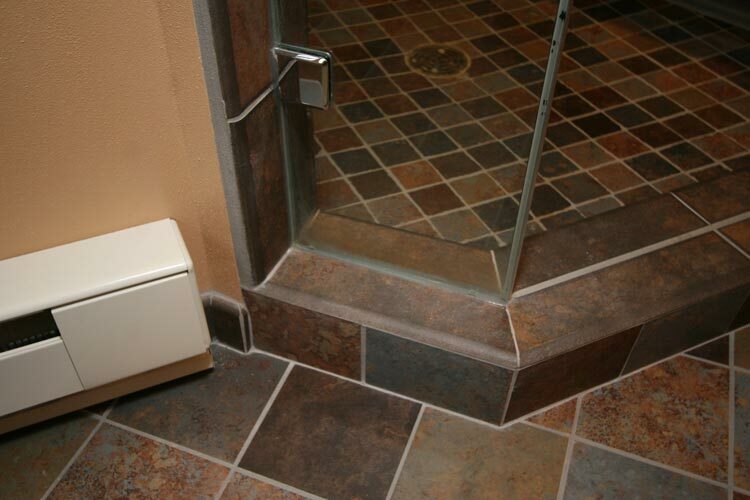 It sounds impossible but, making angle walls out of square walls, mixing tile set patterns from square to diagonal, helped stretch the feel without moving walls into adjoining bedrooms. More than doubling the storage space from the existing floor plan was the extra credit the Wooden Thumb achieved with this new design. A harmonious balance between colors and materials while utilizing the uniqueness of a tight area with angled walls was a accomplishment. We eliminated the tub, making the window easily accessible. 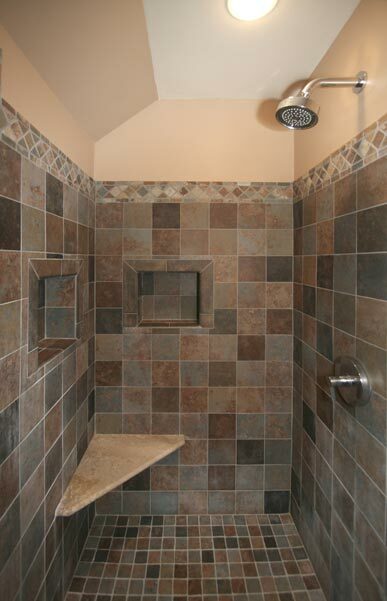 the shower was of average size before, and now they have an enlarged shower with plenty of room. 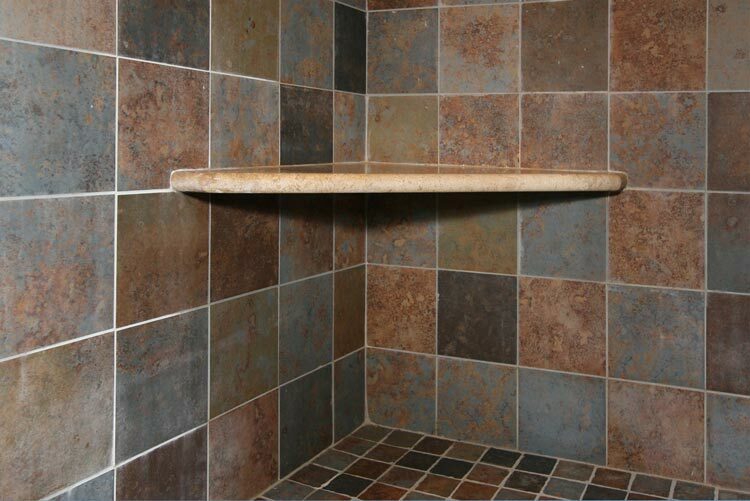 they even have a seat and 2 niches for soap and shampoo. 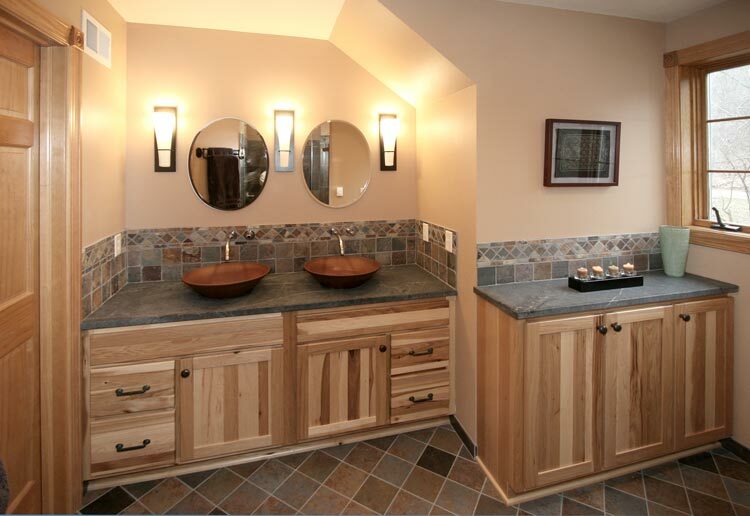 The homeowners expressed interest in double sinks, so the bathroom was also designed to meet their request with two vessel sinks that blended perfectly with the new theme. 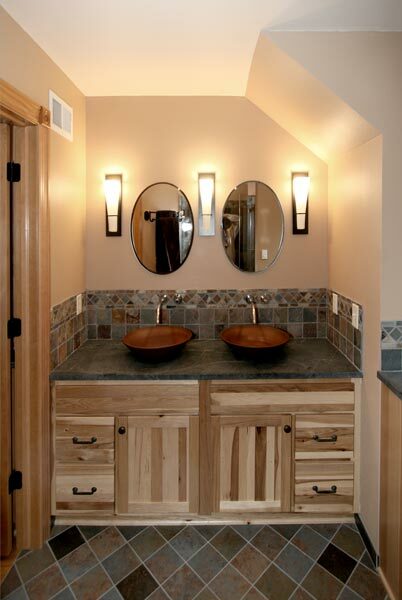 This bathroom was designed using a blend of natural hickory cabinets, slate tile and soapstone countertops to keep with the rustic there they so desired . 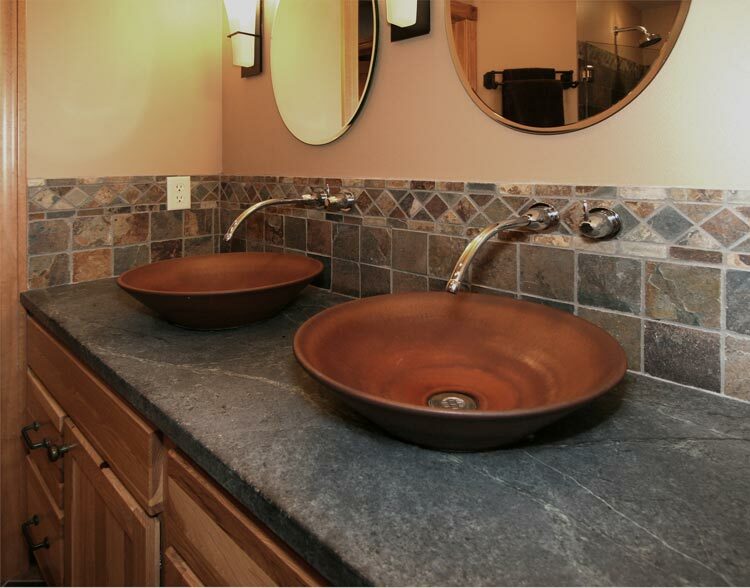 The southwest theme came alive by replacing the shinny tiles with harmonic colors with accent colors using the vessel bowl sinks to bring everything together. 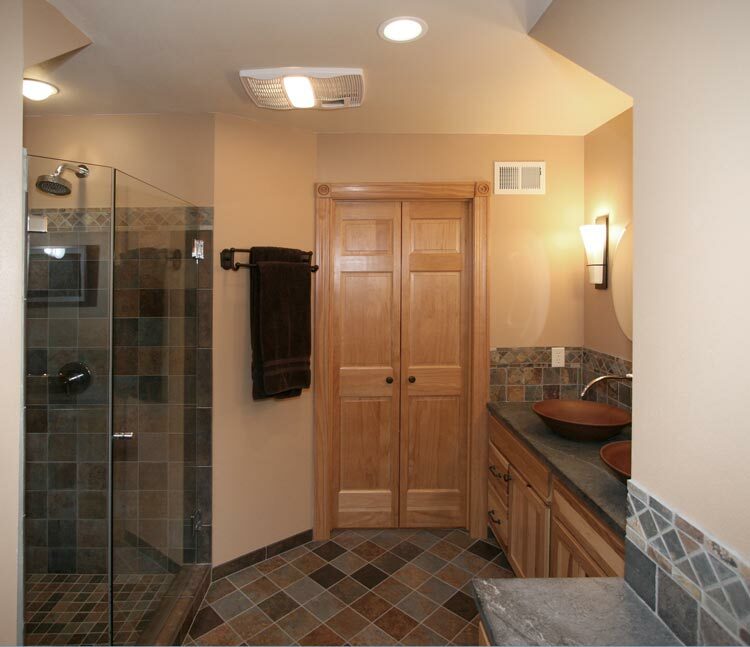 The natural angles the bathroom offered, inspired us to design with a mixture of straight and diagonal tile, which made the space more visually interesting. The vessel bowls, wall sconces, and mirrors added interesting symmetry to the design. The excellent detail incorporated in the tile work, so many shapes, sizes, angles and squares really pulled everything together. 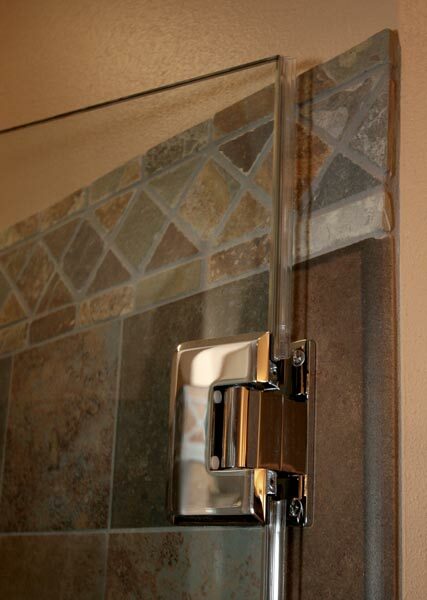 Instead of framed show doors, clear glass allowed the shower to blend in the theme instead of drawing in attention. 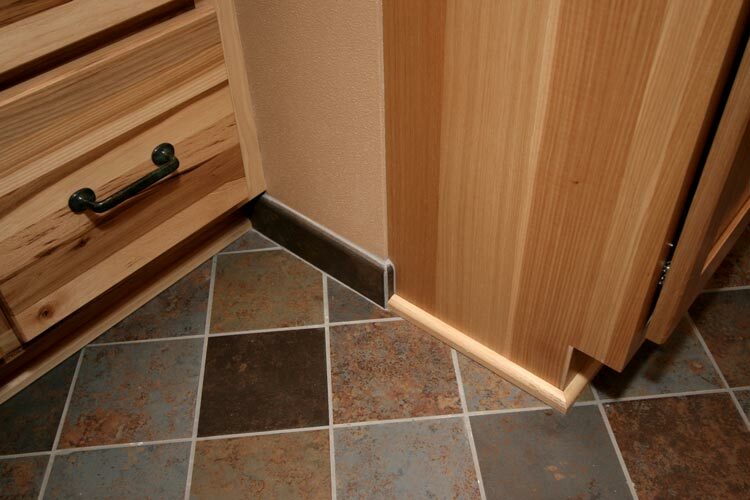 Skillful carpentry created perfect mitered joints and custom storage in the adjoining closet. 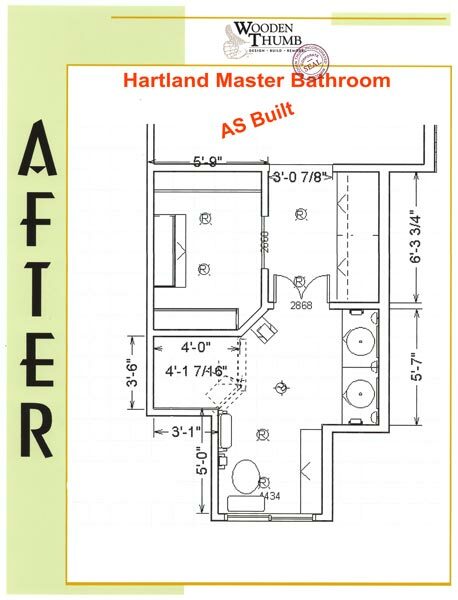 Now, with plenty of storage space, the tub removed, the toilet was relocated out of it’s previously centered location. This new arrangement achieved many of the requirements of the owner, they now have an easy access for opening the window that was difficult to reach in the past. 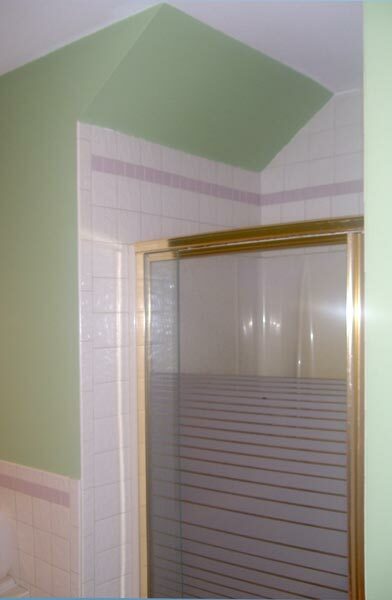 To achieve the larger shower only 6″ was taken from the adjoining closet. 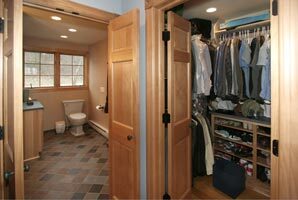 The closet was reconfigured so that it now had more storage and hanging space then the larger pre-existing closet. The new shower had all the amenities that were requested by the home owner. 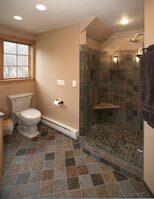 More elbow room, cubbies for shower items and a seat for those long, hard days when a hot steamy shower is the frosting on the cake. Double vessel sinks, Kohler Falling water wall-mount faucets, slate tile along with recessed lights and stylish wall sconces adding more than sufficient lighting as well as the addition of the privacy doors, met with great approval of the homeowner’s rustic southwester style master bathroom. 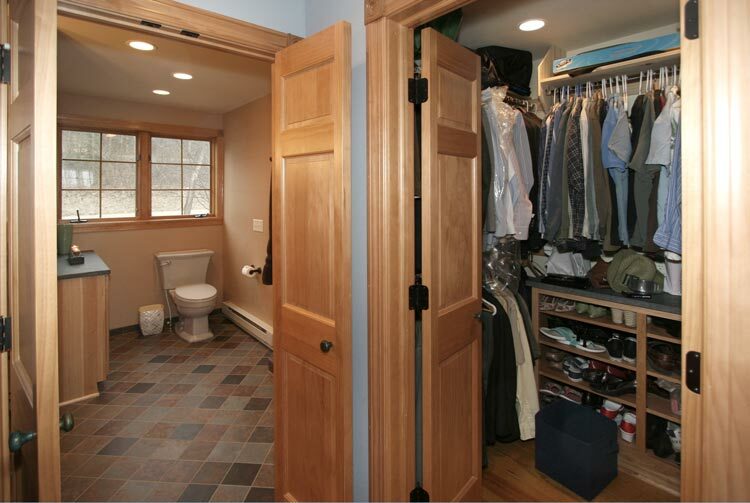 To the homeowner’s delight, the privacy doors now separate the hallway/closet area from the rest of the bathroom.. Additional storage was added to the hallway and closet area and now doubles their existing storage space. Hickory cabinetry, slate tile and soapstone countertops along with two custom vessel sinks and unique plumbing fixtures – Colors and Textures, working together to achieve inspiring results. It’s the attention to the fine details and craftsmanship that set apart an ordinary design from an extraordinary one!